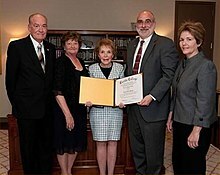 Nancy Regan, with her honorary degree, in 2009. Mikhail Gorbachev, speaking at the awards of his honorary degree from Meji University. An honorary degree or a degree honoris causa (Latin: for the sake of the honour) is an academic degree given by a university to a person who particularly deserves such an honour. It may be someone who has had nothing to do with that university. The person does not have to do any examination. It is purely an honour for whatever good work he or she has already done. Very often the honorary degree is a doctorate.